The Asgard Gladiator Plus Metal Shed will make all of your storage issues a thing of the past. Standing and weighing in at 433kg, the Gladiator Plus shed is one of the heaviest and strongest models on the market today. 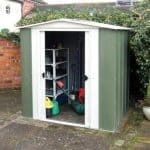 This is a great, large garden shed for when you need good, sturdy outside storage, ideal for your larger garden items including furniture and outdoor toys. It is constructed from thick, heavy gauge galvanised steel panels making it completely weatherproof plus it has a metal floor. The large double doors make it easy to transport items inside and out and gives you access to what you need to use without rummaging around. It is the ultimate in security too as it comes with a robust 5 point locking system, totally pick resistant and finally it comes with a 10 year guarantee. The perfect partner for your garden, you won’t be disappointed! This impressive shed is ideal for larger gardens or commercial outdoor premises and will hold those larger items with ease. 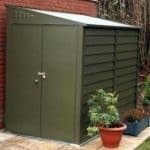 The dark green colour of the metal exterior allows the shed to blend into your garden which of course is important for a large structure such as this. 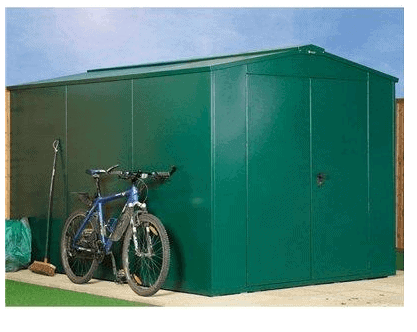 The Asgard Gladiator Plus Metal Shed in Green could prove to be a valuable asset for your outdoor and garden storage. 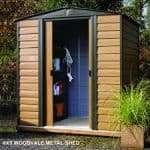 In this section the team at whatshed.co.uk take a look in detail at the various features and benefits that this particular model of shed could offer you and your family. Exterior: Constructed from tough galvanised steel panels, the Asgard Gladiator Plus shed will stand the test of time. The structural materials work to protect the contents inside from both the elements and intruders, combined with lockable doors. 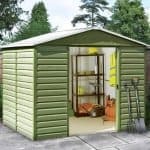 The super-size 7x11ft shed is ideal for the larger garden and those with a larger amount of outdoor and garden equipment to store. Interior: The 7x11ft interior is sizeable enough to store all your outdoor items, ranging from tools to trampolines. Adding freestanding shelving is an excellent way to create additional storage for those smaller items, as well as adding an element of organisation to the shed interior. A ventilation system controls the level of condensation build-up, keeping your items dry and free from mould and damp. Doors: The large reinforced double doors ensure that storing and accessing larger items is not a problem. Standing at the doors allows you a full overview of the contents of the shed, making it easier to locate and access items as and when you need them. Security: A 5-point locking system is integrated into the double doors to ensure that your items are safe and secure at all times. The Asgard Gladiator Plus Metal Shed in Green: How easy to build? 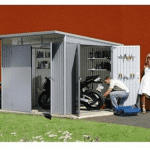 Due to the sheer size of the Gladiator Plus Metal Shed, it is both the manufacturers and the review team’s recommendation that two people work on assembly of the shed together. For safety reasons as well as the size and weight of the panels, we think this is the best way to tackle the assembly process. The shed will be flat-packed and your package will contain all of the panels, fixtures and fittings require for an easy assembly process. We recommend setting aside a day’s worth of free time to assembly your new shed. Complete instructions will be provided with clear instructions and easy-to-follow diagrams. 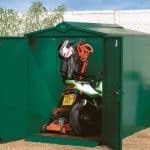 The Asgard Gladiator Plus Metal Shed in Green: What is the overall quality like? Asgard is a company that designs and manufactures metal sheds, from metal bike sheds to metal garden sheds. The Asgard Gladiator Plus Metal Shed gives a strong first impression. With a heavy duty structure and fully weatherproof exterior, you can be assured that your contents stored inside will be protected from the elements as well as damp and mould. The in-built ventilation minimises the condensation build up within the shed interior. 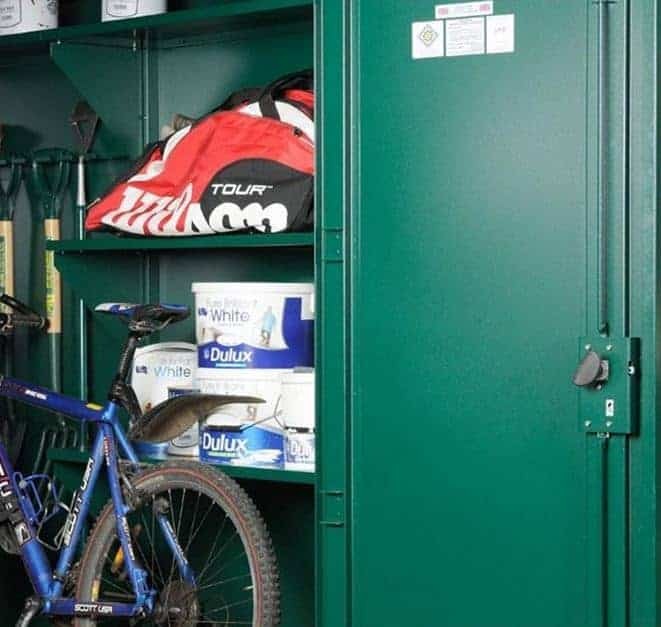 The reinforced panels and locking fixture ensures that security remains a high priority and protects your expensive tools and equipment from outside intruders. 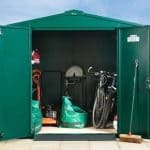 Maintenance for this shed is minimal, however if you wish to maintain your sheds smart appearance then a simple hose down with water every so often will keep it looking clean. 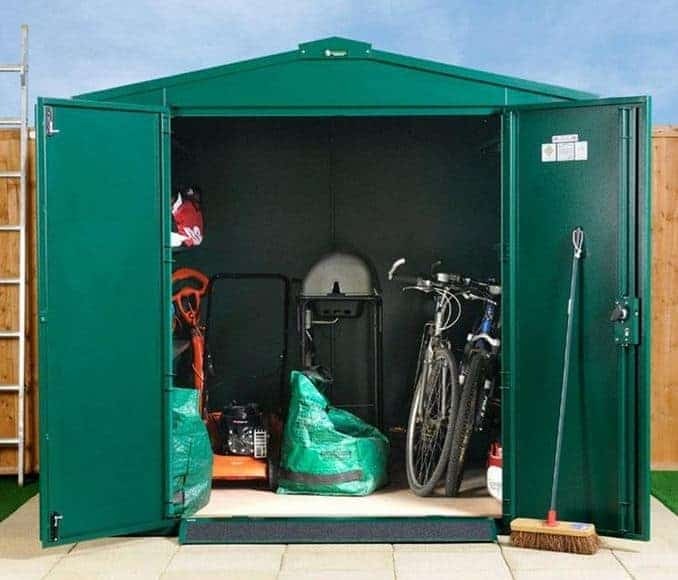 The Asgard Gladiator Plus Metal Shed in Green may look like a huge green storage box, but what it lacks in style it certainly makes up for in strength, practicality and storage space. Store your outdoor and garden items safe in the knowledge that they will be secure and protected from the elements all year round. Don’t let the high price tag put you off from looking into this shed model further, as you definitely get a high quality structure for your money.